Don't let Virgin Australia's baggage allowance restrict the amount of luggage you take to your destination. Instead, ship your luggage with Send My Bag and ensure that you have with you everything you need, including bulky sports equipment like golf clubs or bikes. Get your free quote and discover how cheap it is to travel luggage free. EITHER two small bags with total dimensions of 105 cm and individual dimensions of 48 x 34 x 23 cm OR one small bag, plus a garment bag measuring 114 x 60 x 11 cm. The maximum weight of all baggage is 7 kg. On international long haul flights Economy and Premium Economy passengers may bring one piece of carry-on luggage, plus a personal item. The maximum permitted weight per piece is 7 kg and total dimensions should not exceed 115 cm. Business Class customers may bring two carry-on items, plus a personal item. Weight and dimension restrictions are as above. What if my Virgin Australia Carry On is Overweight/ Oversized? 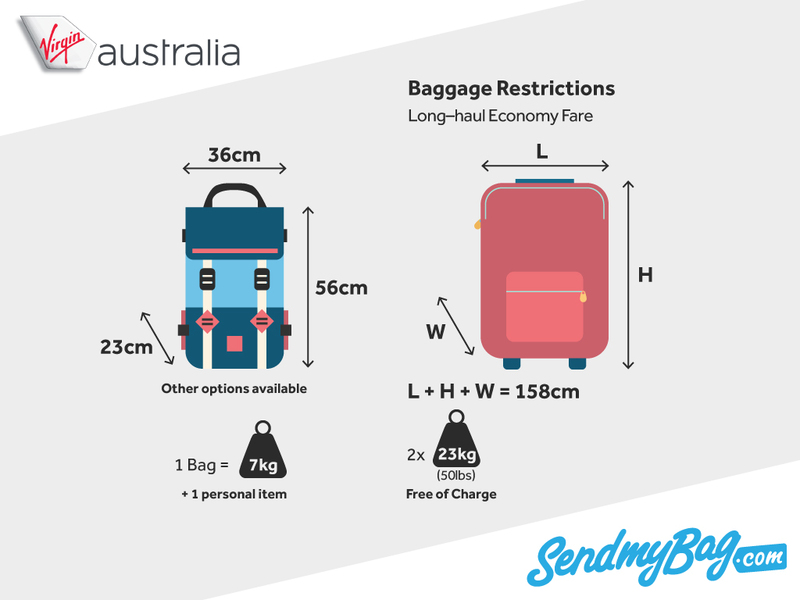 If your bag weighs more than 7 kg or exceeds the dimensions permitted by Virgin Australia’s carry-on baggage allowance, it will be checked into the hold and fees will be charged. Guests travelling with infants sitting on their lap may bring an extra bag including items for use in the cabin, such as nappies and baby food. A standard Economy passenger on a long-haul flight, such as Americas - Hong Kong, is permitted two checked bags that weigh no more than 23 kg each. Bags must not excess 158 cm in total dimensions. Business and Premium Economy passengers are permitted two 32 kg bags. The amount of luggage permitted depends on fare type, route travelled and Velocity membership level. Domestic Economy passengers are permitted one 23 kg checked bag and Business passengers may check two 32 kg bags. Bags must not exceed 140 cm in total dimensions. On short-haul international flights the most basic fare does not include a checked baggage allowance. If you arrive at the airport with more bags than the Virgin Australia baggage allowance permits, you will be charged to check these bags. The fee for this varies depending on the route, but an additional bag on a flight to the USA would cost 160 AUD. Overweight bags (over 23 kg, unless travelling Business class) on such routes are charged at $100 AUD on top of any initial fee. No bag over 32 kg will be accepted. Different extra bag/ overweight bag fees apply on other routes. Note that both an extra bag and an overweight bag charge can apply to the same item. Sporting equipment and musical instruments can either be carried on board the aircraft or checked into the hold, providing they adhere to the standard weight and dimension restrictions of the passenger’s fare type. Each item of this kind counts as one piece of carry-on or checked baggage. Looking for Virgin Australia sized hand luggage?